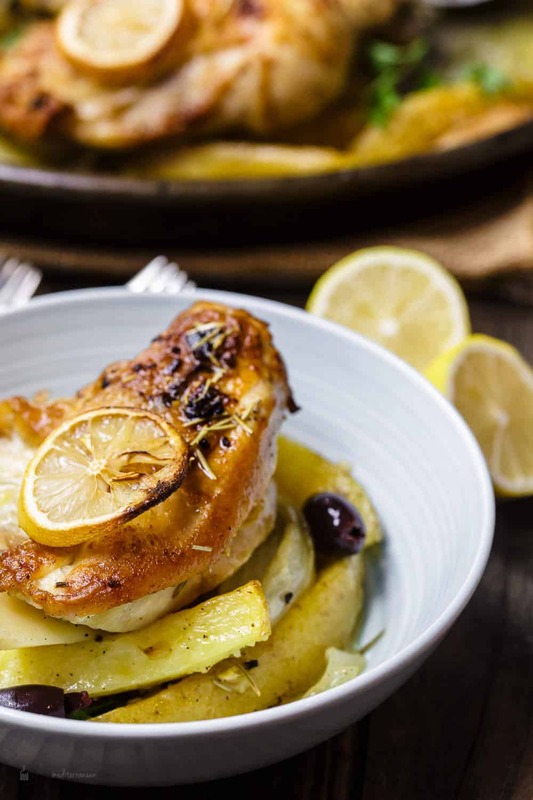 Another winning sheet-pan meal: Greek Chicken and Potatoes! I promise you, this will be a regular on your dinner rotation. 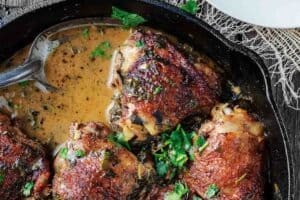 There is absolutely nothing wrong with cooking your favorite chicken (like this one I love) and your potatoes separately. I do it all the time! 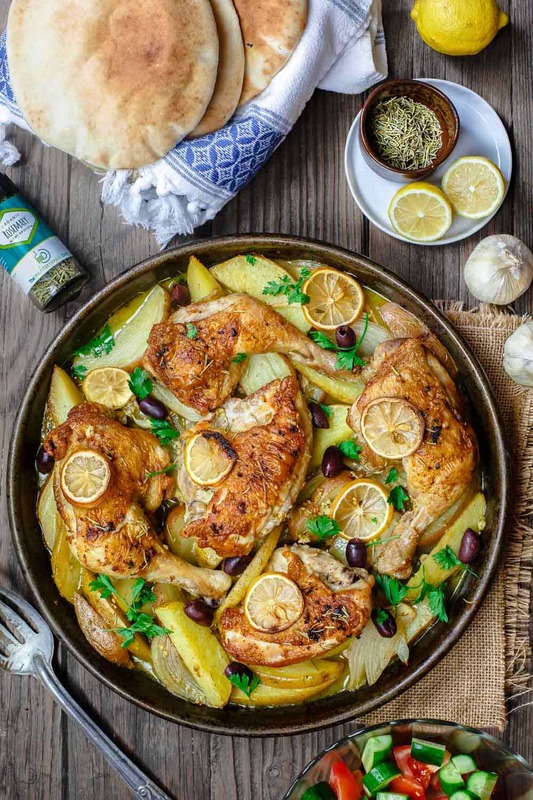 But there is everything right with combining the best of both worlds–all on one sheet pan–like today’s easy Greek chicken and potato! I’m partial to Greek food. If you ask me, I could give you a million reasons why. But if I had to dig deep, it’s probably because Greek flavors are so honest, familiar, and comforting. 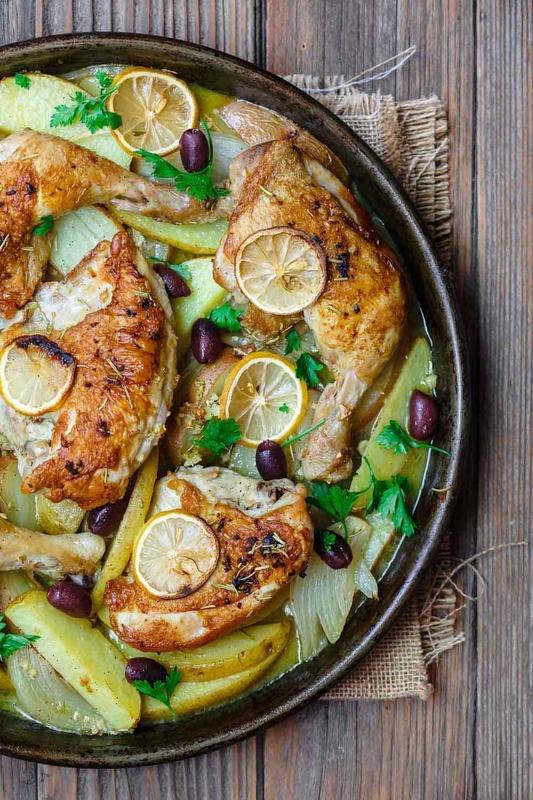 And this Greek chicken is no exception–all the comfort of Greek-style cooking in one pan. What was once mundane, turns a succulent, tangy, vibrant sheet-pan dinner. And with little effort. I like to complete this Greek chicken party with Traditional Greek Salad, or this lazy Mediterranean salad, and a side of creamy Tzatziki sauce. 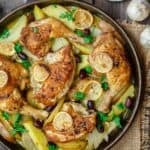 BEST Greek chicken and potato dinner all in one sheet pan! 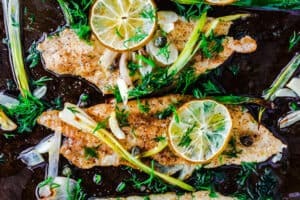 Seasoned with rosemary and baked in a zesty juice with lots of garlic. Definite Winner! Pat chicken dry and season generously with salt (lift the skins and apply salt underneath as well). Leave at room temperature for 30 minutes. Pat dry again if needed. Place the potato wedges and onions on large sheet pan. Season with salt and 1 tsp black pepper. In a large skillet, heat 2 tbsp extra virgin olive oil over medium-high heat. Add chicken skin-side down to brown (about 5 t0 7 minutes,) then flip over and sear briefly, another 3 minutes or so. (do this in batches, if you need to). Transfer from skillet to the prepared sheet pan, nestled between the potato wedges, keeping everything in one layer. In a small mixing bowl, whisk together 1/2 cup extra virgin olive oil with lemon juice, minced garlic, rosemary, and nutmeg. Pour all over the chicken and potatoes; lift chicken pieces so some of the juice will flow under, and toss potatoes until well-coated. Now, pour chicken broth into the pan, but do not pour over the chicken. Add lemon slices on top. Remove from heat and add kalamata olives, if you like. Garnish with a little bit of fresh parsley. 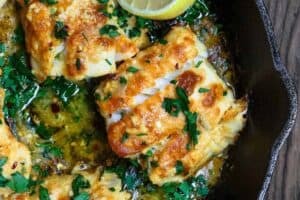 Serve with Greek salad, Taztaziki sauce and a side of pita bread. Enjoy! Recommended for this recipe: Our Private Reserve Extra Virgin Olive Oil; organic rosemary and all-natural ground nutmeg. Save! Create your own 3-pack or create your own 6-pack of all-natural and organic Mediterranean spices! HELLO MISS SUZY: FIRST THINGS FIRST: I AM GREEK—I MARRIED A GREEK GIRL: I MET MY WIFE AT CHURCH FUNCTION.AFTER ONE WEEK I KNOW THIS WAS THE GIRL THAT I WANTED TO SHARE MY LIFE WITH.-THE SECOND WEEK I JUST TOLD HER WHAT A BEAUTIFUL LIFE WE COULD SHARE.—THE THIRD WEEK I ASKED HER FATHER IF I COULD IF HE DID”T MIND I WANTED TO MARRY “AGNES”.—10 MONTHS LATER WE MARRIED.AFTER 59 YEARS OF A WONDERFUL LIFE,AGNES DEVELOPED “COPD”. I MISS HER—-HER COOKING AND JUST HAVE SOME ONE TO HOLD AND LOVE. AGNES PASTED AWAY SEPT.2 2018.————-I JUST YOUR SUPER RECEIPES.—————THANK YOU,SINCE I LIVE A LONE, ( NO FAMILY CLOSE) WHEN I COOK I HAVE DINNER FOR TWO OR THREE DAYS .SUZY, THANK YOU FOR SHARING.————THANK YOU,JOHN KARANIKAS.IF YOU WANT TO SHARE MY COMMENTS WITH ANY ONE, I THINK IT WOULD BE A GOOD JESTER ON YOUR BEHALF. Thank you so much for sharing, John! What a special connection you had. I’m so glad the recipes here have been helpful to you. the flavors deserve 10 stars!!! but the excess liquid issue, which others have mentioned, IS a problem! next time i am NOT doing the chicken broth–what’s the reasoning anyway? i did 4 bone-in, skin-on thighs and 2 split breasts; i quartered tiny “bliss” potatoes; added cherry tomatoes; capers; and did red onion vs yellow. i also used lemon zest with the juice. temp was 400° F for 1 hour and STILL potatoes AND chicken were not done–and all were sitting in a sea of juice. additional 30 min and the food was cooked, but it was a nightmare maneuvering the pan with that boiling liquid! i had to spoon a lot of it out & down the drain–not happy. i WILL make again, but skip the broth altogether… the garlic & lemon created the best flavors! 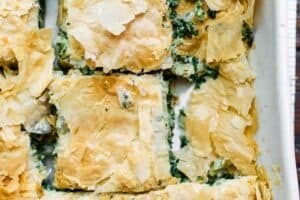 i HIGHLY recommend adding capers… i crumbled feta over the vegetable mixture while still warm. AMAZING! Thank you for sharing! It’s great to hear you enjoyed the recipe. And I guess easy is relative to different cooks. 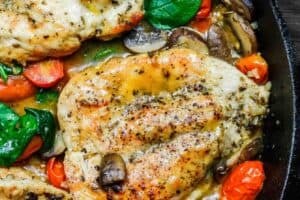 I have been making ALL of your recipes fo about 3 weeks and every single one is so tasty and fresh! Thank you. 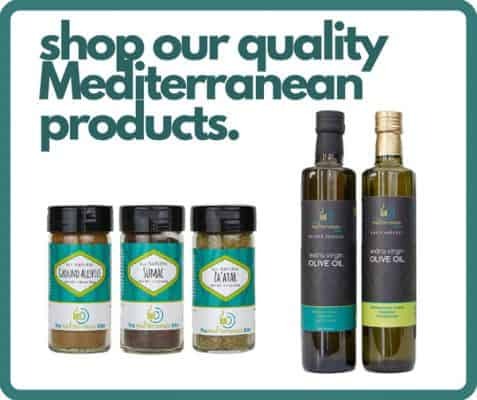 We are loving eating the Mediterranean way.